The monster called DOOMSDAY may be most famous for killing Superman, but now it's Batman's turn to become the unkillable Kryptonian superweapon. That's the shocking transformation set to be chronicled in DC's BATMAN: THE DEVASTATOR, a story told as part of the larger METAL event, in which the entire Justice League will do battle with an army of evil Batman doppelgangers. The army hails from what's being called DC's 'Dark Multiverse,' a sea of endless parallel worlds where nightmares come true. In this case, the many ways that Bruce Wayne's rage, pain, and obsessive mission could have driven him to become a villain... usually stealing the powers of his League allies in the process. Since there's no real way for even an evil Batman to steal Superman's powers for himself, he's forced to do the next best thing. He's used Kryptonite to best Superman in the past, so perhaps it's not a massive stretch for him to experiment with a form of the Doomsday Virus, turning himself into the same bony, oversized, unkillable monster the once punched Supes into oblivion. And now that the artwork for THE DEVASTATOR #1 has been released, fans can see this twisted vision of Superman's most trusted ally for themselves. So far DC fans have heard of several Dark Multiverse Batmen, from the Batman who steals Flash's speed, to the version of Bruce Wayne who became The Joker. Even a reimagining of Bruce Wayne's own origin story, when a power ring landed on his finger the night of his parents' deaths, turning him into a muderous Green Lantern called Dawnbreaker. But for Man of Steel fans of the 1990s (or the adaptation seen in Batman V Superman) nothing beats Doomsday. 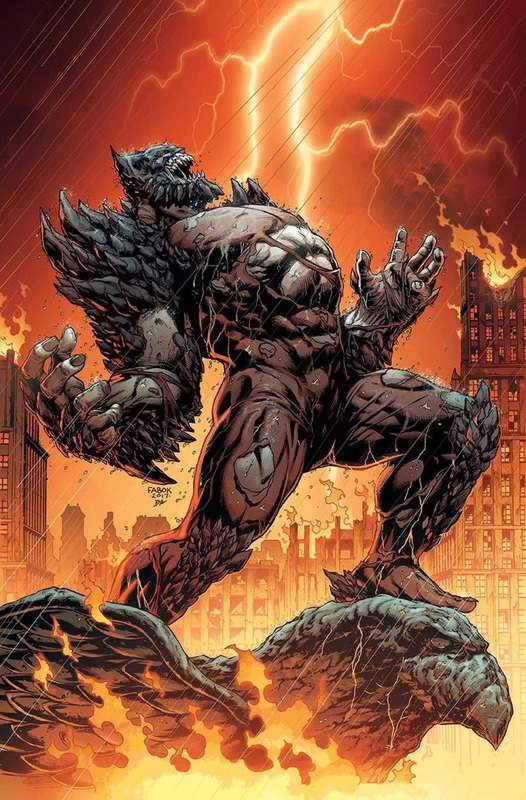 The first announcement of the Evil Batmen revealed concept art of the Doomsday Batman, but this artwork offers something different: the moment that Batman successfully infects himself with the Doomsday Virus. At least that's the impression given, with Doomsday's famous grey flesh and bony protuberances erupting out of the Batsuit. And loathe as we are to read too much into a single image, the roaring laugh/grin on Bruce's (Bruceday? Doomswayne?) face suggests this villain may be less sympathetic than other variations. "What if he[Bruce] this one turn as a kid and wanted to bring his parents back in a way that would take him into the dark? What if after Superman died, Batman started experimenting with the Doomsday virus in a way that would prevent this from ever happening again, but he goes too far?... Why Bruce might use the Speed Force to try and be faster should a catastrophe have happened. Why he might go up against Ares." We can only assume that the death of Superman will lead to the burning cityscape behind the Doomsday Batman's birth (with the eagle, as opposed to a gargoyle suggesting Metropolis, not Gotham). The real question, then, is how much destruction this Multiverse DEVASTATOR will wreck on his own world before storming into DC's main universe. THE BATMAN WHO LAUGHS #1 (on sale November 15). BATMAN: THE DEVASTATOR #1 releases on November 1st, 2017.